Scotland’s first minister, Alex Salmond, has set September 18, 2014 as the date for the referendum on potential Scottish independence. Polls have been relatively consistent, with support for independence at around 30% to 35% and with support for continued union with England at around 50% to 55%. 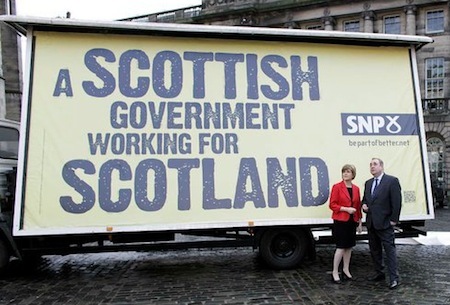 But the up-or-down vote will come in 18 months, and a lot can obviously change in 18 months, including the popularity of Salmond (pictured above) and his Scottish National Party, which won in 2011 the first majority government since devolution in the late 1990s. Shetland and Orkney. Shetland and Orkney, the groups of islands to the northeast of Scotland, could well stay within the United Kingdom if Scotland leaves. That would complicate the Scottish economic rationale for independence, dependent as it is upon North Sea oil revenues. It’s no surprise then, to see Liberal Democrats encouraging Shetland and Orkney to think of themselves as a unit within the United Kingdom than as just an appendage of Scotland. Tory incentives. As Liberal Democratic deputy prime minister Nick Clegg has sharply noted, Conservatives do not have an incredible incentive to fight hard to keep Scotland in the United Kingdom, given that they hold one seat. It’s fair to worry that Tories actually have an electoral incentive to see an independent Scotland — though, because the Scots are just 8.5% of the UK population, it’s not as much as you might think. Labour prime minister Tony Blair’s massive 12-point 1997 landslide was still a massive 10-point landslide within England proper. In the 2010 general election, Labour won 28.1% in England and 29.0% nationwide, while the Tories won 39.6% in England and just 36.1% nationwide. So it’s a boost, but not a gigantic one. Europe. Also, there’s some dicey choreography with the European Union too, because as the United Kingdom approaches prime minister David Cameron’s promised 2017 referendum on potentially leaving the EU, the more it could have a negative effect on the Scotland effort. In fact, even with sluggish growth in the next 18 months, I think the anti-Europe tone in England is the biggest threat to the anti-independent forces in very much pro-Europe Scotland. If Nigel Farage’s United Kingdom Independence Party (UKIP) continues to make further gains in advance of the 2015 general election, it could well scare some of the pro-union, pro-European Scots toward the independence camp. Despite what anyone in Brussels or Berlin or London or Edinburgh says, no one thinks that Scottish independence would leave it outside the EU for long. Given that the Scots have implemented as much of the acquis communautaire as England has, it’s certain that the Scots would align independence with simultaneous Scottish accession to the EU. That’s a non-issue. Previous PostMeet the new heir to Hugo Chávez: the feistier, populist Capriles 2.0Next Post¡Hasta siempre, comandante!